Pace is looking to expand the project to other areas. In May, Chicago’s Pace Suburban Bus awarded Motor Coach Industries (MCI) a contract for 13 MCI Commuter Coaches with an option for 37 more. Pace will use the new coaches to replace older buses and those leased from MCI, on its popular “Bus-on-Shoulder” service, which debuted in 2011 between Chicago and the southwest suburbs. 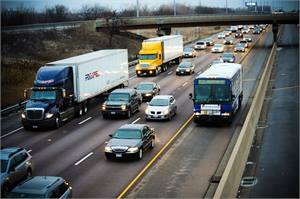 In November 2011, Pace in a cooperative effort with the Illinois Department of Transportation (IDOT), the Regional Transportation Authority and the Illinois State Police, launched the Bus-on-Shoulder program, which allows commuter buses to use the shoulders of the Stevenson Expressway (I-55) during rush-hour congestion, leading to reduced travel times, more schedule reliability and environmental benefits gained as more motorists use mass transit. Under the program, Pace buses use the shoulder when traffic in regular lanes is flowing at less than 35 miles per hour (mph); buses using the shoulder cannot travel at speeds greater than 35 mph, or 15 mph faster than the flow of regular-land traffic — whichever is less. Special signage and roadway markings show where buses can use the shoulder, and the buses have markings indicating they are authorized to use the shoulder. Shoulder riding has been cited to be one of the most affordable options for implementing bus rapid transit (BRT) on highways because it is less expensive to modify shoulders than it is to construct new roadways and requires little capital investment compared with rail alternatives. Due to the overwhelming success of the program, Pace is expanding its Bus-on-Shoulder service and will use the new MCI Commuters for that service. During the program’s first year, Route 855 ridership rose 67%, and Route 755 ridership surged 120%. Those numbers are continuing to soar. In July 2013, ridership grew 441% on Route 755 and 119% on Route 855 from July 2011 to July 2013, according to Pace numbers. The program has also reduced travel times and improved on-time performance. 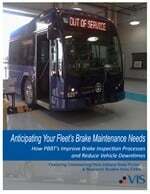 Pace reports that before the program, about 68% of trips on routes 755 and 855 arrived at their destinations on time. Since the pilot program began, on-time performance averages 92%. When the service began, Wilmot says travel times were so unpredictable that Pace wouldn’t even publish arrival times for its afternoon or evening rush hour services at its suburban park-and-rides for the two routes. “After transitioning to this program, we were not only able to begin scheduling arrival times of those trips, but in May, we were able to make those a little bit more aggressive, because we were finding we were running a little ahead of schedule thanks to the travel time savings,” says Wilmot. To accommodate increased demand, Pace has already increased the number of inbound trips during the morning rush hour and outbound trips during the evening rush hour to 32 on its two routes between the southwest suburbs, the Near West Side and downtown Chicago. It also recently added midday service that never existed before as well as some later evening service. “The nice thing about that is it offers riders a lot more flexibility, so if someone needs to leave the office early or stay late, they can now do that and still use our service, which wasn’t an option before,” Wilmot explains.